According to a new study, 65 percent of American adult Internet users have interacted on a social media site like Facebook, Google+, or LinkedIn, supporting the often cited importance of social media marketing. The social networking report from the Pew Internet & American Life Project has been asking adult Internet users in the United States about social media site visits since 2005 when just 8 percent of Internet users 18-years-old or older had visited one of the sites, compared with 65 percent just six years later. What’s more, for the first time, more than half of all American adults — Internet user or not — has visited a site like Facebook, LinkedIn, or Google+. Social media usage has grown significantly since 2005. Pew reports that some 43 percent of adults say they visit a social media site on a typical day — compared to 65 percent that have ever visited a social media site. Only email and search queries are more common among American web users. Pew also reported that woman tend to be more likely to engage regularly on a social media site than do their male counterparts. In fact, 69 percent of female, adult Internet users socialize — versus about 60 percent of men. On a typical day, 48 percent of female Internet users log on to a social media site. The same can be said about 38 percent of male Internet users, according to Pew. 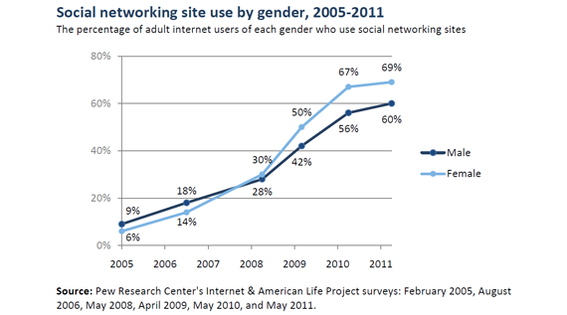 Women are likely to use social networking sites. 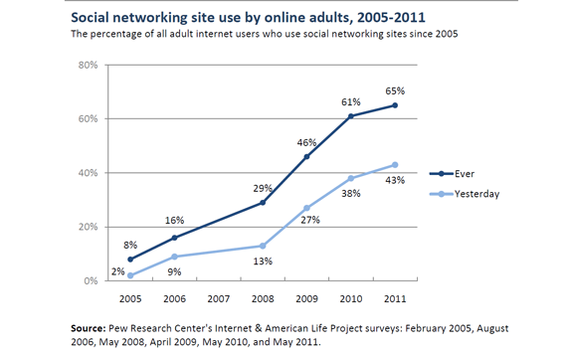 The number of social-site visitors grows with a younger demographic, Pew said. A full 89 percent of female Internet users aged 18-to-29 have ever visited a social networking site. Some 69 percent socialize online daily. Roughly 83 percent of 18-to-29 year olds, regardless of gender, have used a social networking site, making social networking popular with nearly everyone in the age group. Pew Internet also reported that survey respondents generally had positive feelings about the social networking sites they used. Many users have good feelings about social media, as shown in this related word cloud from Pew. Survey data like what is found in this Pew Internet report tends to reinforce what marketers are experiencing. Social media is where many, if not most, Internet users — especially younger ones — can be found on a given day. Social media should typically receive a significant portion of a marketer’s attention.